Buchu, has a distinctive sweet, lemony fragrance and is unique to South Africa. The botanical has been part of the indigenous culture and heritage for centuries. Its earliest documented use was in 1652, when the Cape’s resident Khoisan pastoralists introduced the first Dutch colonists to the healing herb. Then it was an extremely scarce and expensive commodity– a mere thimbleful could be exchanged for a sheep. Now you can enjoy it in a 100% pure, organic tea bag. Buchu is a natural diuretic and is a valuable source of vitamins A, B, C, and E, as well as numerous minerals, antioxidants and disease-preventing flavanoids. 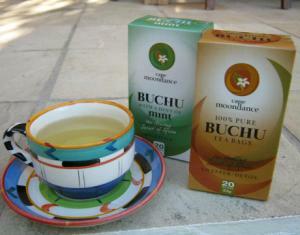 Four lucky readers can each win one packet of Cape Moondance 100% Buchu tea and a packet of Buchu with a hint of Mint. To enter send an email to melissa@lifeinbalance.co.za with the email header ‘Cape Moondance Buchu Tea’. Winner is chosen via a lucky draw and there is only one entry per reader accepted. Entries close on the 25th September 2013. Available at Shoprite, Pick ‘n Pay, Spar, Dischem and Wellness Warehouse outlets nationwide, at a recommended retail price of R35.99.